Anne wins her battle with evaporative dry eye through a combination of LipiFlow and intense pulsed light (IPL). She is another successful Philadelphia Lipiflow patient who feels LipiFlow has allowed her to get her life back and reduce stress at work and at home. An example of someone who had been told to use Restasis, take artificial tears, and call me in 6 months. 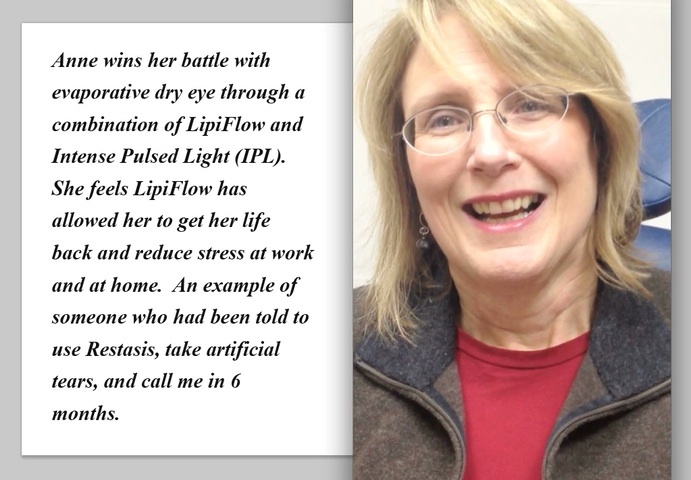 If Anne’s story sounds all too familiar to you, you may also benefit from Lipiflow treatment. Contact the Dry Eye Institute and Dr. James Lewis today at 215-886-9090. In addition to treating evaporative dry eye patients, Dr. Lewis treatments Philadelphia Sjögren’s Syndrome patients.